The Scorpions have announced a series of fall US concert dates. The two-week, five show run – with guests Queensryche – will begin in Lake Tahoe, NV on August 31 and see stops in California, Texas and Florida. Part of the German band’s 2017-2018 Crazy World Tour, tickets for the US events are available now. During the extended tour, the group released a new collection, "Born To Touch Your Feelings - Best Of Rock Ballads", last fall. The project features fourteen of the band's most famous ballads, a new acoustic recording of "Send Me An Angel", and three new tunes: “Follow Your Heart”, “Always Be With You” and "Melrose Avenue." Produced by Mikael Nord Andersson and Martin Hansen, the set is named after a track from The Scorpions’ 1977 album, “Taken By Force”, demonstrating the band’s commitment to the art of the ballad. 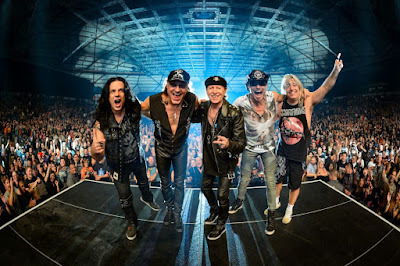 The Scorpions are currently playing shows in Mexico before resuming an extensive European tour in the Czech Republic in early June.